I have a little altered friendship mini to share today using the Bingo card stamp as my base. OHHH did I have fun stamping this using different patterned papers. I wanted an old vintagey look ....almost like antique wallpaper combinations. I backed each bingo card with chipboard and sanded the edges for a worn and seamless look. Than I went to work creating some embellies using the Rose garden stamp set. Keeping with the vintagey look I stamped onto some gingham fabric and antique pattern papers. Love the demension the old pattern paper gives to each rose. I did the same for the middle bingo card using a butterfly stamp from the vintage treasures set . I added the sweet On the fence die to the bottom of each card. I added some bits and bobs...buttons, ribbons, and of course a few pearl jellie dots . I decided to also add some sentiments to this...I wanted it to be a friendship mini....something you could give to a friend for a bit of cheer so I added some of the sentiments from the friends set. After that I just HAD to give it some shimmer...so I went crazy and glittered the whole thing with some Diamond glitter in clear . Love the subtle shine it gives! Color Inspiration with Guest Designer Eva! We’ve had Eva Dobilas of The Love of Life blog creatively guest designing for us this month and we’ve loved every moment of it. Her eye for color combination and sweet diverse designs have really inspired us. Today’s post is without exception. Enjoy! Today I have some pretty things to share made with more Rubber Cafe goodies. My first item is a tag. 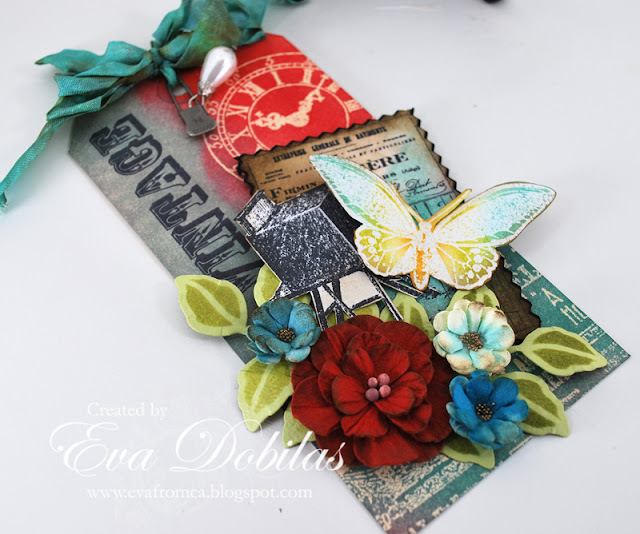 I simply love making tags and when I first saw the Vintage Treasures set I knew I was going to make a tag for sure with it, so that was the birth of this tag. Take a look at this Tim Holtz inspired tag of mine. I love this stamp set and today I have two ways to show you how you can use it. But first about my tag. I stamped some of the images with black ink and some I clear embossed on the tag, such as the clock and I just used my Distress Inks to color in the tag. I also clear embossed the pretty butterfly onto white paper and colored it in with Distress inks. 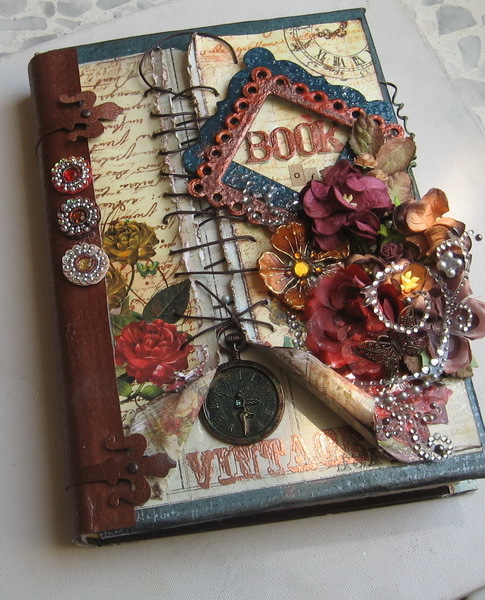 To complete my tag I used Spellbinders Foliage dies and also added some pretty Petaloo flowers. Here is a close up of my tag. 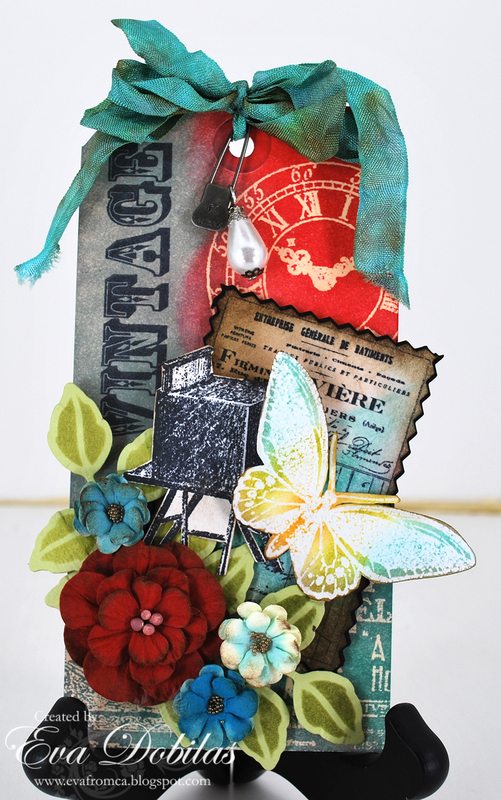 I mentioned above that the same Vintage Treasures stamp set was used on my second project, too, which is a card. I love the background stamp from that set, so I wanted to create my card's background with it. I combined this with the very unique and beautiful Lace Flower stamp which I colored in with Copic markers and my sentiment came from the Fabulous Phrases set. Once again I wanted to thank Rubber Cafe for having me as a guest designer this month....I have had such a pleasure working with these pretty stamps and the dies, too. As always, thanks for visiting and wishing you a beautiful day! We’d like to thank Eva so much for being our July Guest Designer! She did a fabulous job. Today I have a sweet summer time card to share with you. And I'm using some of my favorite products from The Rubber Cafe'! I'm using the Mini Jar, and bumble bee from the Love Bug set, and to help finish off my bottom edge that wonderful die made for us by Spellbinders, On the Fence! I found some fun metal mesh trim to top off my jar so my bumble bee can't escape into the summer air! For my backround I punched a scallop circle to use as a mask so I could ink and create my clouds. My phrase is the 'Smile' portion of the 'You make me Smile' stamp from the Fabulous Phrases set. Which I stamped directly onto my fence. To complete my layers, I used border punches for my grass and a scalloped floral ground. Hope you're had a great weekend! Be sure to check back in tomorrow as Eva our Guest Designer shares some more of her amazing projects using The Rubber Cafe' products. I made using stamps from the Rubber Cafe'. This project idea can be used to decorate your home or make a fun party banner. 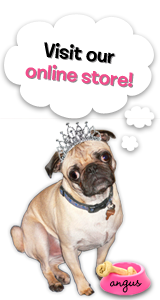 So check out my sweet "I love you" banner! On this project I use Labrador Love and Birthday and Balloons stamp set. I stamped my images directly to fabric that I've cut into banner shapes and then colored with magic marker colored pens. Thank you stopping by everyone. I hope you will enjoy your summer weekend. Hi All...I have a couple of bright summery cards to share with you today! 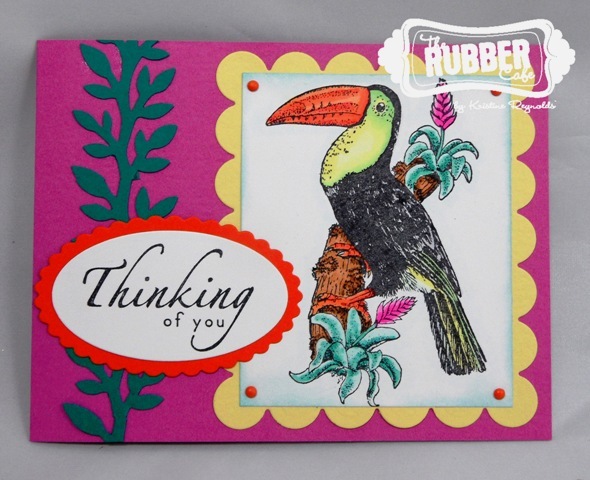 I had stamped and colored these two Toucan images a while ago and thought I would use them for today's projects. I made a couple of fun cards for you. 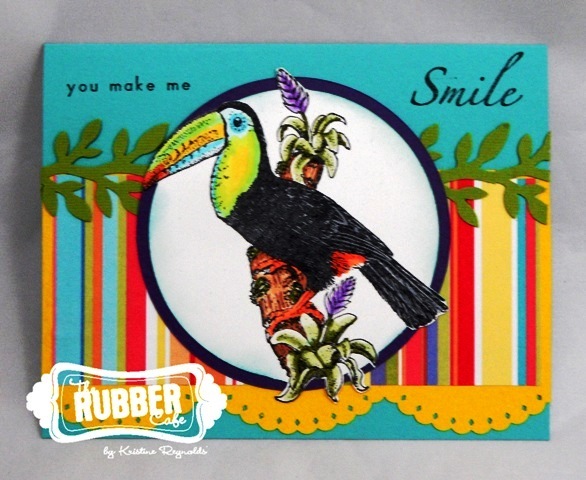 I think this Toucan would be great for scrapbooking too...Hawaii vacation pages, a trip to a bird sanctuary, or anytime you want to create a tropical feel. I used sentiments from Fabulous Phrases on both of the cards. I hope these two cards put you in a summery mood! 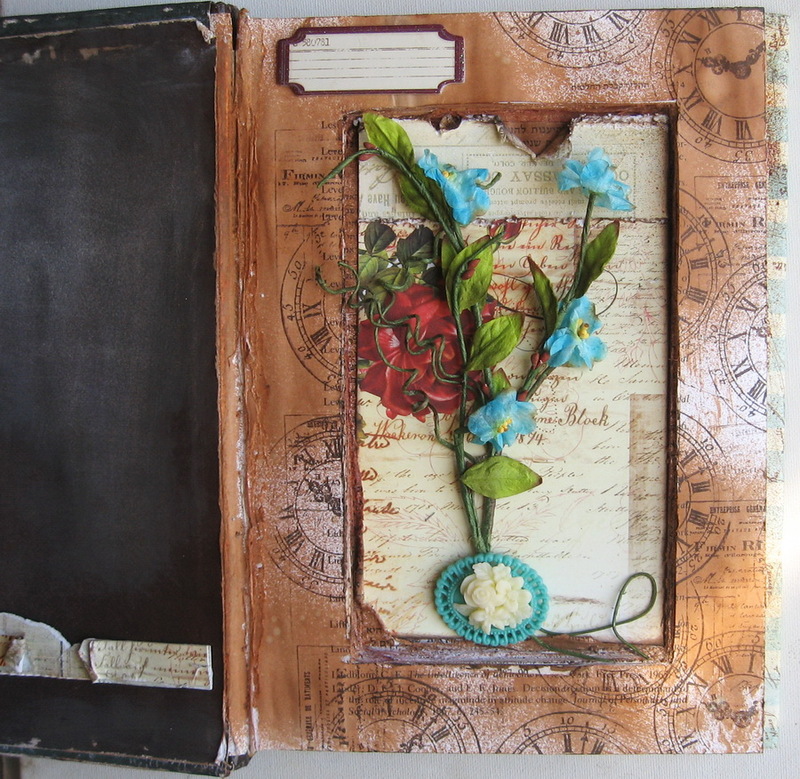 My Altered Book Vintage Style! 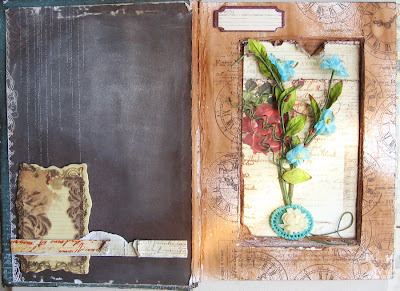 My new altered book started out as a real old and useless item until I altered it into this beautiful vintage project. To complete my transition, I chose Prima products and stamps from The Rubber Cafe both working beautifully together on both the cover and the inside of this old book. 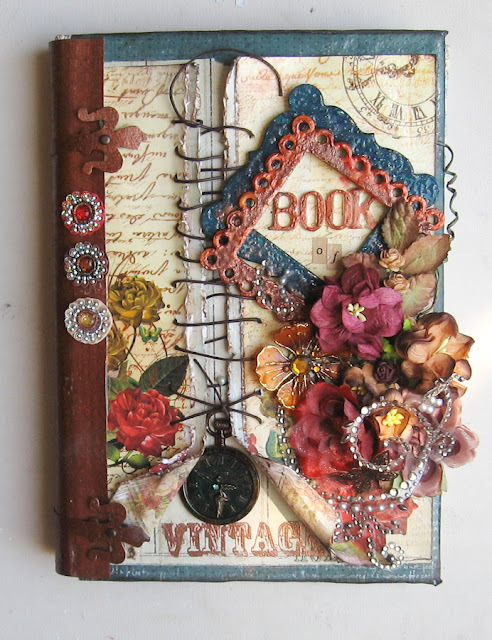 My projected is called, Book of Vintage, so the word Vintage from the Vintage Treasures set was a perfect fit. I also stamped part of a clock from the same set as Vintage is all about a time that passed. 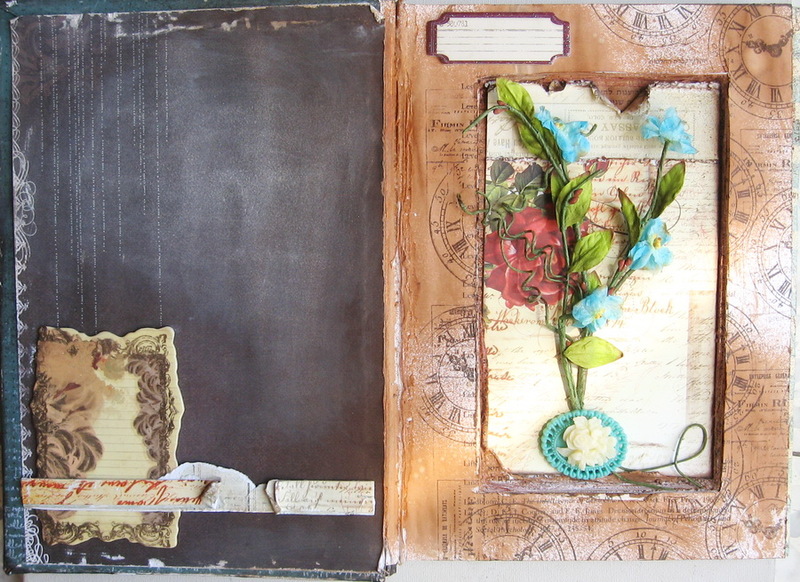 On the inside I used the same clock and a script stamp all over the cut book page, and distressed with Tim Holtz Tea Die Distress Stain. I stamped with Truffle Inx and heat embossed with Copper embossing powder. A little closer view of the inside. My Scrap Happy glue was just perfect to glue all trinkets, flower and small pieces to complete my large embellishment clusters.